Better on black.. Rain couldn't have stopped much before daylight. The droplets were everywhere - and I can't pass up a raindrop, spider web, or squirrel. It's vibrant with the bubbles from the rain and the bright green showing through. It's all so pretty, even the brown leave below. This is so pretty. Love the raindrops! 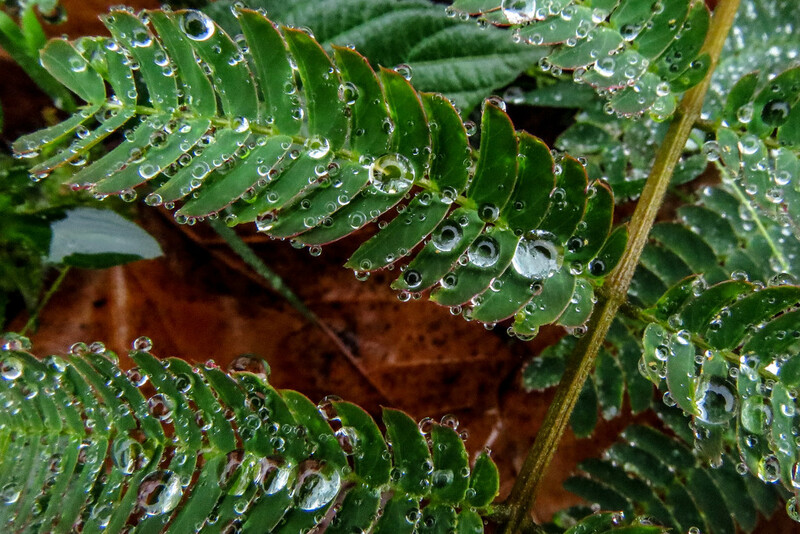 The fern looks so fresh having just been washed by the rain. I love the water droplets, especially the drops dangling on the edges. Beautiful! Beautiful on black. Superb focus and clarity on those lovely droplets! The raindrops sparkle on black. The droplets are lovely, I also like the shapes and patterns of the leaflets. Very pretty capture and yes, enhanced by the black ground.